Who would have thought that the comfy mattress you’ve been sleeping on for years contains dozens of potentially harmful substances and materials, from petrochemicals to adhesives to dyes to flame retardants, among other toxins and carcinogens. Luckily for green-minded consumers, there’s never been a better time to find a truly “green” mattress. 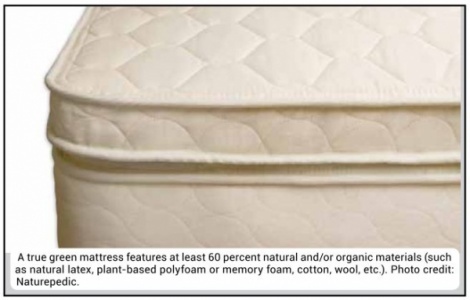 “Green technology and innovation have impacted a wide range of industries in recent years… and this growing demand has led many mattress manufacturers to offer sustainable products as well,” reports Tuck, a website dedicated to improving sleep hygiene, health and wellness through the creation and dissemination of comprehensive, unbiased free resources. “However, terms like "green," "natural" and "eco-friendly" are often misused or exaggerated within the mattress industry.” Further complicating matters, there is no regulatory body fact-checking green claims within the mattress industry, although certifications are available for certain mattress materials like foam, latex and fabrics. So, what’s a green-minded, healthconscious mattress shopper to do? There is no overall certification for green mattresses per se, but there are certifications that apply to certain types of mattresses and their materials. If a mattress meets the Global Organic Textile Standard (GOTS), at least 95 percent of its materials are certified organic, while certain noxious chemicals (chemical flame retardants, polyurethane) can’t be present at all. Meanwhile, the Global Organic Latex Standard (GOLS) certifies that a latex mattress is made from 95 percent organic latex, with similarly stringent restrictions on what can be in the remaining five percent of the mattress. Foam mattress buyers should keep an eye out for the CertiPUR-US label, which certifies polyfoams and memory foams as made without ozone depleters, chemical flame retardants, heavy metals, formaldehyde and phthalates, and emit little if any volatile organic compounds that can compromise indoor air quality. To learn more, peruse Tuck.com. The freely accessible database contains information on 125,000 different customer experiences from nearly 1,000 individual sources. CONTACTS: Tuck, tuck.com; GOTS, global-standard.org; GOLS, https://goo.gl/THzRCp; OEKO-TEX, oeko-tex.com; CertiPUR-US, certipur.us. EarthTalk® is a weekly syndicated column produced by Doug Moss and Roddy Scheer for the nonprofit EarthTalk. To find out more, submit a question, or make a donation, visit us at EarthTalk.org.